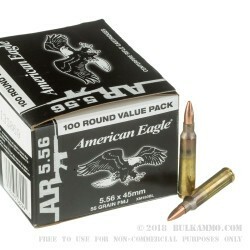 This 5.56x45mm ammo comes packed in a bulk 500 round case with 5-100 round boxes inside. Loaded at the Lake City Army Ammunition Plant, this ammunition is loaded with full metal jacket boat tail projectiles yielding reliable feeding and appealing aerodynamics as it exits the muzzle at approximately 3165 feet per second. The boat tail design at the base of the bullet improves the ballistic coefficient and due to the huge scale production advantages at Lake City this high quality product is available at a competitive price. 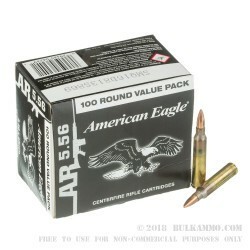 This ammo uses boxer-primed, reloadable brass casings that still show the annealing marks from the production process around the case neck which is the standard for visual inspections required by the US military. This ammo is non-corrosive and will not attract a magnet. Who wouldnt want ammo that doesnt fail? Q: Is this ammo reloaded? A: No, this Federal 5.56x45 ammunition is brand new, not reloaded. There are two things to consider here - the pressure that each caliber is loaded to, and the dimensions of each chamber as specified by SAAMI, which regulates these sort of things. 5.56 ammunition is loaded to higher pressures, and 5.56 chambers are cut to allow this pressure to build up safely. .223 ammunition is loaded to lower pressures, and the chamber dimensions are tighter in comparison to 5.56. As a result, firing 5.56 ammunition through a .223 chamber can result in pressures that are even higher than what 5.56 would cause in a 5.56 chamber, and much higher than .223 would cause in a .223 chamber. These pressures are unsafe and the .223 weapon is not designed to operate under the forces that result. An immediate catastrophic failure is not likely, but malfunctions and rapid component wear are certain to occur. Neither we nor SAAMI recommend firing 5.56 through a .223 chamber. Q: With all of the ballistic tests that have been done down through the existence of modern ammunition, have there been any test to compare which of either 5.56 or .223 is the better overall ammunition? A: The difference between 5.56 and 223 Remington is fairly clear. 5.56 mm NATO ammunition is loaded to higher pressures and therefore achieves higher velocities when compared to 223 Remington. 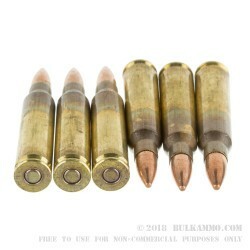 A 5.56 mm NATO chamber can fire both types of ammunition, whereas a 223 Remington chamber should only be used to fire 223 Remington ammunition. Q: I understand that 5.56 is metric and .223 is American and both are somewhat interchangeable. Has there been any effort to standardize both rounds into one caliber? A: Both originated in America. External dimensions are identical. The major difference is that 5.56 is loaded to higher pressures than .223. Considering the number of weapons that have been built to cycle 5.56 and/or have not been built to handle pressures higher than that of .223 over the last six decades, and the various needs/purposes of people that buy both types of ammo, combining the two into one would be virtually impossible.